One of my favorite hobbies is painting silk scarves. They have become very popular accessories and the possibilities are endless. 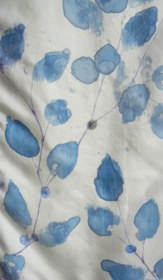 Painting wet into wet on Habotai (a lightweight sheer silk) produces lovely watercolor effects. More concentrated color applyied to heavier silk such as Silk Satin(SS), Crepe de Chine (CDC) or Silk Charmeuse (SC), which have a lovely drape, creates a richer effect. Here are a few of my latest creations.